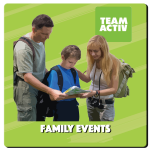 Our family events promise fun, laughter, adventure, thrills, spills, and challenges for all the family, with activities designed for all ages & abilities, giving you the opportunity to play and discover together. Team Activ outdoor activities are crafted for the adventurous, the curious, and also for those seeking the peace and tranquility of the outdoors. To ensure our events are a perfect day out, we combine the fun & adventure with the convenience of good facilities; good food, a place to sit and relax, contemplate, reflect, think, or just laze the day away! Our recent family events include Go Wild In Rabbit Ings – a Halloween themed event with a difference, where families walked, ran and hopped on their bikes to find all the monsters around Rabbit Ings, with surprises along the way. 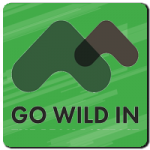 What is Go Wild In? Finding fun, physical challenges that everyone in the family can enjoy is tough. That’s why we created Go Wild In. Our Go Wild adventures are days packed with physical feats and healthy family-to-family competition. And afterwards, there’s time to kick back and relax with music and mouth-watering food and refreshments from local suppliers. You’ll pit your wits, speed and strength against families just like yours with a series of challenges in a breath-taking location. Challenges include climbing, orienteering, running, cycling, problem solving, nature trail navigating and zip wire activities!